It was a weekday and I awoke just like every other morning, groggy and wiping the sleep from my eyes. I followed my typical routine—getting dressed and eating breakfast—before walking out the door. But my morning's familiarity ended here. The first snow had fallen to the ground while I slept and, for once, the snowflakes gathered, leaving the homes and streets white and sparkling. Yawning, I drove away, making the first tracks in the pristine snow. Working a baker's hours means I get to greet the morning long before it first hits light. As I walked the rest of the way to work under the falling snow, my feet left the first imprints on the day. The world was silent, still in bed, with the covers pulled up to its chin and dreams still filling its head. It felt surreal, surrounded by all this beauty, with no one to share in it but me. I opened the shop and assembled the ingredients for the morning's pastries, the drifting snowflakes just visible through the storefront window. The music from the radio and the hum of the refrigerator harmonized, while the rotating blades of the stand mixer clashed, creating a familiar dissonance that has started to define my mornings. Once I get the first pastries in the oven, the smell of baking scones begins to fill the air. The scent slips out under the door and slowly drifts down the city streets. The first customers of the day often tell me that the scents from the bakery lure them in, making the cold streets just a little bit warmer as they begin their day. Though I dread waking so early in the morning (and oh do I dread it), once I find myself in the comfort and warmth of the bakery the world seems to make just a little more sense. My hair may be disheveled and my apron covered with flour, with dried dough hidden on my forearms and cemented to my fingernails, but this is the reason it's worth it to wake up so early in the morning. This feeling. And though I can't explain it, it just feels right. These Cranberry White Chocolate Tarts are fresh and colorful, with no shortage of flavor. Almond shortbread tart crusts are filled with a thin layer of white chocolate and topped with another layer of cranberries, combining three flavors I've grown to love together over the last month. 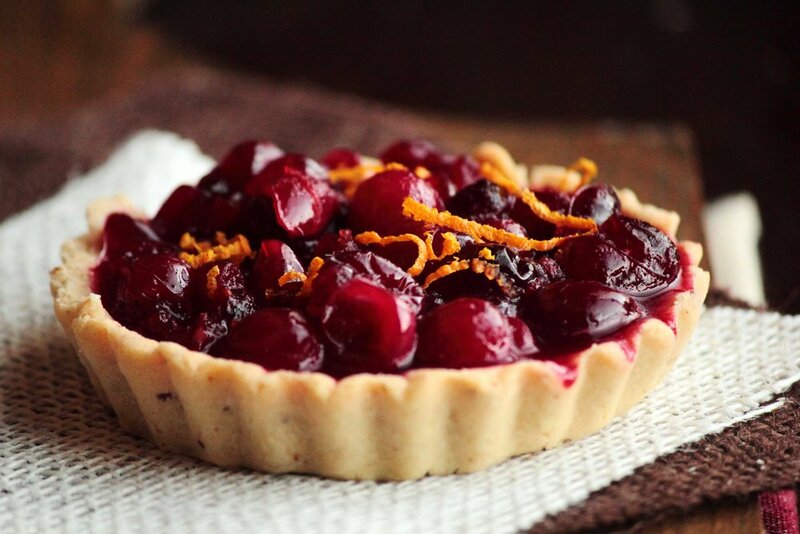 I topped the tart with the simple homemade cranberry sauce I shared with you recently and it was a perfect match. If you are looking for last minute dessert ideas for the upcoming holidays, this is an easy and delicious choice. These are even perfect to make after the holiday, if you find yourself with some leftover cranberry sauce. In a food processor, blend together flour, sliced almonds, salt, and sugar. Add cubed butter and process until mixture resembles coarse sand. Blend in the egg and ice water and process until dough comes together. Refrigerate for 2 hours to firm up the dough (or freeze for 45 minutes to 1 hour). Roll out the dough on a lightly floured surface until it is 1/8-inch thick (you may have to wait a few minutes for the dough to soften). Cut out rounds of dough to fit the tartlet pans (alternatively, if you are making a large, single tart, roll out the dough and cut a large circle to fit the tart pan). Press the dough carefully into the pans. Stab the bottom several times with a fork so the dough will bake evenly in the oven. Bake the tart shells for 15-18 minutes, or until they are lightly colored and the shell feels dry to the touch (the larger tart may take slightly longer. Watch closely). Let cool completely before filling. Melt white chocolate chips in a double boiler, stirring until smooth. Remove from heat and fill tart shell(s) with a thin layer of white chocolate, spreading it up the sides of the tart shell (this will prevent the cranberry filling from making the tart shell soggy). 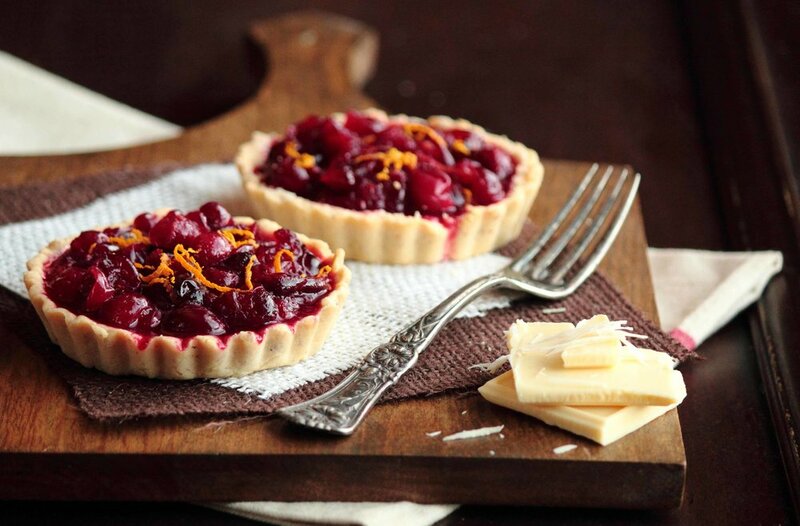 Fill tart shells with cranberry sauce and garnish with orange zest. Keep tarts refrigerated until ready to serve.